For a compact yet powerful solution to your delay-absent problems, the Boss DD-3 Delay Guitar Effect Pedal is here to add masses of dynamic proportion to your performance. Featuring 3 delay modes with adjustable time, continuous delay and shimmering feedback based chorus delay, the DD-3 has something for all styles. This simple to use but exceptionally capable pedal will fit your pedalboard with ease and was designed to be gigged hard thanks to the rugged metal housing. The DD-30 is capable of producing incredibly short delays right down to 800ms to give you a chorus-based effect. In contrast, you can stretch your delays right up to 12.5 seconds for some huge padding. There are also controls for feedback, hold and echo levels so that you can truly shape the delay to your exact specification. A hold function means that you can hold a delay cycle on without decay so that it can repeat as long as you need it to, superb to use in crescendo's on those crucial buildups. 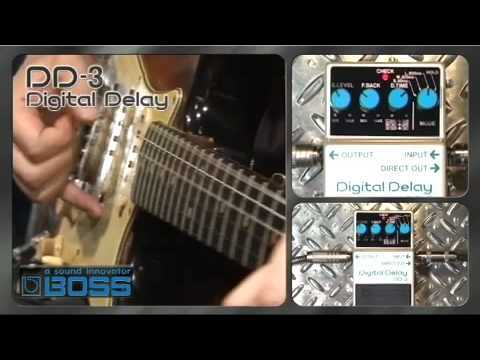 All guitarists know how important delay can be and the Boss DD-3 Delay Guitar Effect Pedal is ready to give you rackmount quality delay in a tiny unit you can use anywhere. Weight 0.4 kg/ 15 oz. Posted on 09/12/2016 by NickElysium Great pedal. Got mine from Reading branch. Used it on a couple of tracks and it works (But annoys the bass player :P) Been experimenting with it and other effects. Will be putting this through its paces this Sunday. Well done Matt from Reading's, Dawson's .